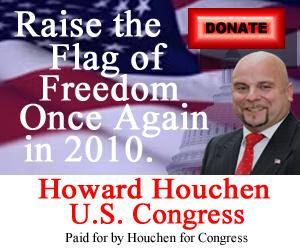 Howard Houchen, one of the Republican candidates for Congress in the 2nd District, is advertising on the Drudge Report. The ad is below. Houchen seems to be the most aggressive candidate so far; Dan Arnett and Daniel Edmonds have also appeared at many GOP meetings throughout the district, but Houchen appears to be the first to take his campaigning beyond meetings of the Republican faithful. However, none of the candidates so far have submitted reports to the FEC, so we do not know how much cash has been raised, if any, by the candidates.